You are here: Home / Lost Pet Behaviors / Bebe: Peepless in Seattle! 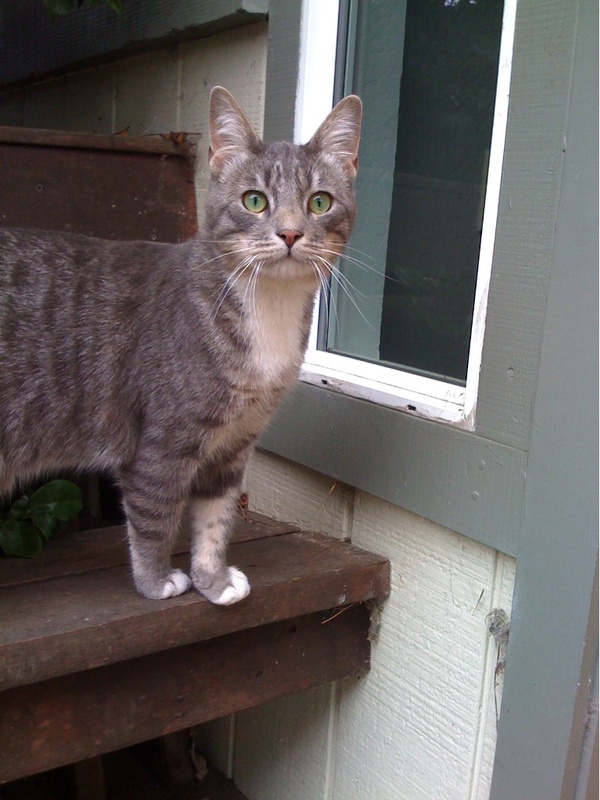 On November 4, 2011, the grandmother of Bebe-the-tabby cat was transporting him from northern Washington to live with his mother, Corri, who lives in Half Moon Bay (San Francisco), CA. During a late night stop at a Motel 6 in Tacoma, grandmother opened up Bebe’s carrier and he bolted! He was last seen running into the juniper bushes of a house in a residential area next to the motel on the S/W corner of S. 76th Street and S. Wilkenson Street. The grandmother searched, but she could not find Bebe. She was forced to continue with her move to California, heartbroken. Her daughter Corri called Missing Pet Partnership on November 8th and asked for our help. In most cases, we have a cat owner here in our town who we work side by side to help them search for their missing cat. But in this case, if our volunteers did not search for and find Bebe, we knew he would end up being absorbed into the feral/stray cat population. It just so happened that when Corri called, MPP had a producer in town who was here to film our searches in order to develop a training video. The Bebe investigation seemed like a compelling yet EASY case to work because from the very beginning, we believed that Bebe was likely still hiding in the immediate area. That’s because after interviewing Corri, we determined that Bebe is a “Cautious Cat” and these cats typically hide in silence near the escape point and just do not travel far. We knew that with a little bit of time, some food, a wildlife camera, and then a humane trap, we could catch him and get him back home. HA! So, Missing Pet Partnership responded with a group of volunteers and conducted an intersection alert, tagged our cars, and posted giant neon posters. We filmed all of this in anticipation of finding Bebe within a few days, perhaps a few weeks. 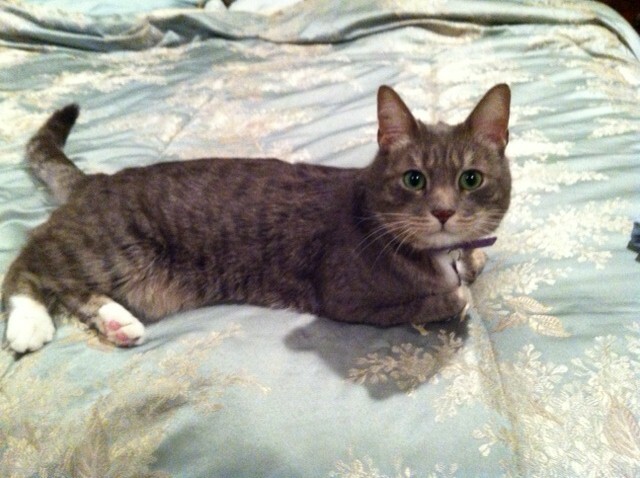 In fact, in the case of Smokey, the other missing cat we searched for, we captured him in a humane trap one week after his escape (on Thanksgiving Day!). But as the days turned into weeks, there was NO sign of Bebe. We put up feeding stations and wildlife cameras but NOTHING. 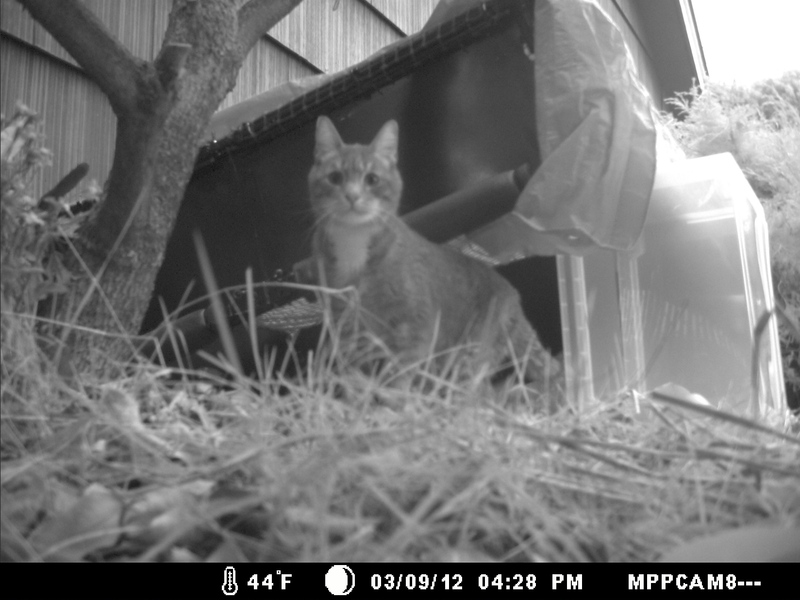 We thought we had a cat that looked like him on camera in mid December, but it was not him. As January and February rolled around, I have to confess that I was losing hope because in all of that time we did not have one single confirmed sighting. But thankfully we had three committed volunteers (Chris Duvall, Annette Lanker, and Bob) who continued to put up signs, put out food, and check the wildlife camera (set up in the juniper bushes at a vacant house on the S/E corner of 76th & Wilkinson) several days a week. Then, quite unexpectedly, Chris Duvall called me on March 8, 2012 to tell me, “Kat, I have a gray tabby that we caught on camera. I think it could be Bebe.” Well, as you probably guessed, I was skeptical. In spite of the fact that I continually PREACH to pet owners to “not lose hope” I had, in fact, lost hope! But as Chris and I examined the photos and compared the patterns of stripes and the patterns of white on the paws chest of the cat in the photo, we had no doubt in our minds that the cat caught on camera WAS BEBE! First photo of tabby with white paws with markings that matched Bebe! We immediately set in motion plans to set up a drop trap (at the vacant house) and to capture Bebe during a surveillance operation. We went out and set up the drop trap at the vacant house, set up the wildlife camera, and removed all food from the area. We wanted to make certain Bebe would go under the drop trap before we set up the operation. 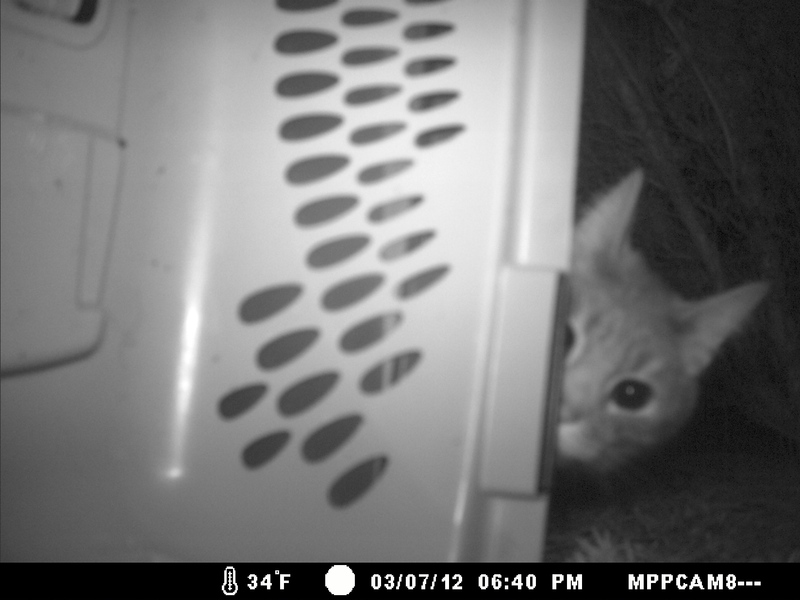 The next day, we pulled the camera and wah lah, there was Bebe (watch it on YouTube) going under our drop trap! Bebe Under the Drop Trap! So, get this, we go out there on Saturday (March 10th) in the afternoon just to set up our cameras and plan everything for the capture that we already had volunteers signed up to help with ON SUNDAY when suddenly someone said, “There he is!” Sure enough, Bebe was sitting across the street (at the house on the N/E corner of 76th & Wilkinson) grooming himself! We captured it on video, and it’s posted on YouTube here. Of course, when we moved, Bebe darted. So I snuck around the other side of the house and sure enough, he was right there. Bebe froze and when I took a step forward, he darted directly towards the hole and went under the house! 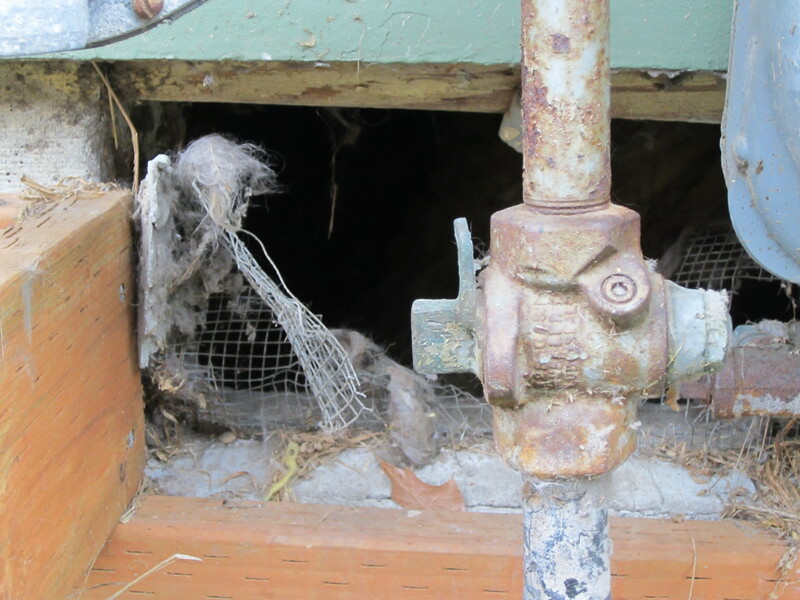 We snapped a picture of the hidey-hole so that you could see the accumulation of cat hair fibers. We call this “high probability evidence” that we train pet detectives to look for when searching for a missing cat. It signifies this location (entrance under this house) is an entrance/exit point for a cat who repeatedly goes in and out from that space. We’d found Bebe’s new home–and it was just across the street from where he’d escaped 4 months before! Thankfully, the home owners (Brenda and her son Trey) were Bebe fans and agreed to let us set up our cameras and trap and operation in their yard, so we jumped into action. We moved the drop trap from the vacant house and set it up right outside the hidey-hole, set up a nanny camera right by the trap, ran an extension cord and hooked it to a TV monitor in a gazebo on the other side of the house, huddled up in silence and prepared to catch a cat. We taped a quick “set up” piece (watch on YouTube) with me sitting next to the TV monitor (which shows the drop trap) for the training video. What happened next was completely unexpected (and a bit comical). Bebe came out of the hole, walked up to the drop trap but did not stay under it long enough, and then sauntered calmly within ten feet of us, froze in place, and stood there staring at six pet detectives who were trying to stay still and not breath! Needless to say, Bebe bolted and ran back under the house! It was dark already and we were unprepared to conduct a full stakeout, so after an hour of waiting with no cat, we decided that we’d continue the drop trap operation the next night as originally scheduled. 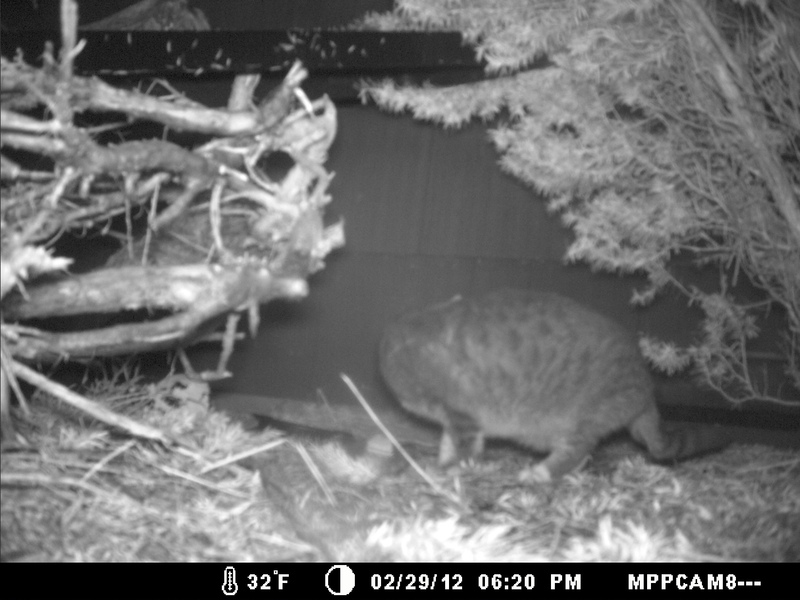 But in the off chance that Bebe might go into a normal humane trap, we set one up and baited it with food. Well, we should’ve known that Bebe is just not your typical cat. Ten minutes after we all left, Bebe went into the humane trap! But, true to form with all our other camera malfunctions, we did not capture the actual capture on video! 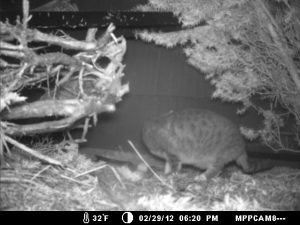 Instead, the wildlife camera recorded Bebe for 30 seconds as he ate food outside of the trap (watch here), then it kicked into the 60 second delay (which was during the point Bebe was captured and what we WANTED to get on video), and then it kicked in to record Bebe already in the trap. So much for capturing it on camera for a training video! I did shoot some video AFTER Bebe for the training video which you can watch here. Throughout this investigation, we encountered the following obstacles: a very pregnant owner who lived in California and could not come search for her own cat, a cat that was displaced in known coyote territory, freezing temperatures that included three snow storms, New Years Eve fireworks, apathetic employees of nearby businesses (who refused to let us post signs), the theft of one of our digital wildlife cameras, one crabby neighbor who clearly hated our signs (and cats), a group of over zealous neighborhood watch volunteers who thought our posters were illegal (they were not) and ripped them down, a failed drop trap operation due to Bebe being smarter than our rescuers, flubbed up filming due to equipment failures, and then a lack of funds to get Bebe back home. To give you perspective on the distance that Bebe traveled during the 4 months that he was “lost,” I snapped a photo (below) from the exact spot where Bebe escaped (which was on S. 76th Street across from the Motel 6). You can see an intersection ahead (with a round-about-curby-thing in the middle to slow speeders and trip up drunk drivers). 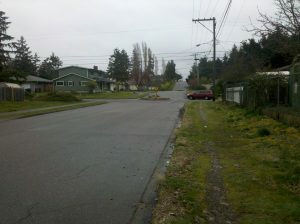 Bebe was last seen running into the bushes of the house on the right side of this photo by that telephone pole, he was captured on camera at the vacant house right behind that maroon van, and we was living under that split level green house (and was captured in the trap there) on the opposite corner. Focusing your search CLOSE to the escape point, using the proper tools, and having hope are key to recovering a skittish lost cat! Bebe’s owner Corri was not able to fly from California to Seattle for a reunion. She had a newborn baby, a new job, and she did not have the funds to buy tickets for MPP volunteers to transport Bebe. Because Bebe already escaped during transport (escaped from a crate in a car) once before we did NOT want to transport him by vehicle. And since MPP had worked cases (like the search for Wenty at SeaTac airport) of cats that escape carriers when transported in cargo area of planes, our plan was to HAND DELIVER him to Corri in California by flying with him in cabin (with an MPP volunteer). Bebe peaking around the corner of a crate lid that fell from the camera after he apparently bumped it! We put out a plea for donations and managed to raise $350.00, but the money was not needed to pay for the transportation after all. That’s because an angel (Denise) who works for Alaska Airlines was able to arrange to use her benefits to fly with Bebe and our volunteer, Chris Duvall. They flew on standby, so the flight was actually cancelled twice and rescheduled. I REALLY wanted to be there, but ultimately I declined so that Denise and Chris would have a better chance of making the flight (with 2 people vs. 3). Bebe was reunited with Corri on April 5, 2012, exactly 5 months after his escape. Here is video of the reunion at the airport (thankfully Corri did not open the cat carrier until Bebe was home!). Bebe’s recovery was the cover story for the Half Moon Bay Review and Corri shared the Bebe story on a local (Bay area) pet talk show. We hope Bebe’s story will inspire cat owners to understand the behavior of displaced skittish cats, how lost cats can actually be closer than you think, that using the proper recovery techniques (wildlife cameras, humane traps, patience, and hope) are critical, and to never, never, NEVER give up hope! Money raised for the Bebe case was used to purchase two digital wildlife cameras. Although it is not tax deductible, if you’d like to support MARN efforts to train people to recover more displaced cats like Bebe, please consider making a donation via PayPal (please list as donation) or you can send a check to Missing Animal Response Network % Kat Albrecht, 424 W Bakerview Rd, Suite #105-360, Bellingham, WA 98226. This recovery would not have been possible without the leadership of MPP volunteer Chris Duvall and the hardwork of Annette Lanker, Bob, Trey, Earl, and the other neighbors, and all of the other MPP volunteers who went out on this case during the various efforts to find him from November through March. GREAT JOB YOU GUYS!!! To say that I am very proud of you is an understatement!